Image protection and copyrights are a rather sensitive topic for photographers. Nobody wants their images to be stolen, especially when that’s how you make a living. In a perfect world we wouldn’t even have to talk about this, unfortunately that’s not the case. The internet is a big copy machine. From the most basic techniques ( Like a simple right click and “Save As…” ) to iCloud Leaks, images get stolen online all the time, it’s likely that someone may even profit off of it. And even if all your efforts were to be successful, if someone really liked your pictures, they would just plagiarize them. Sure, you can bend over backwards searching the internet for your images and send DMCA notices everywhere, without a guarantee that they’ll go through. You can use services that do this for you if you want some help. There are even services that claim to make your images “un-downloadable”, but in reality they probably will only slow down the thief, that’s about it. How to protect your images ? Start with the understanding that “pirates are gonna pirate“. This holds true for everyone online – photographers, software and game developers, content writers, musicians, movie makers, the list is endless. I’m not saying it’s okay or that you should just ignore it. I’m saying that you should prepare yourself and realize that it’s not the end of the world if someone happens to steal/copy your images. I think that this proverb really applies to this topic. It’s not we can’t get in somewhere because of a lock on door, it’s that most of us have an understanding that we aren’t supposed to trespass a locked door. In other words – you can’t prevent people from stealing your images, but that doesn’t mean you shouldn’t discourage it either. Maybe a past client wants to share an image from your portfolio on his website or Facebook feed without even knowing that you care about your copyrights. Or maybe a blogger who isn’t technically advanced enough to work-around preventative measures wants to download an image form your site. By now I think you understand my position on image protection, to be perfectly honest – there is no real way to protect your images, as I said earlier – you can only discourage image theft. 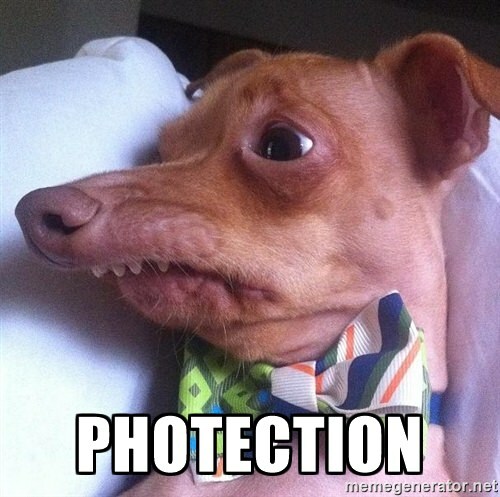 So when I decided to make a plugin to help with image protection – Phteven was instant inspiration to me. So Photection was born. It’s like image protection, but a little awkward and not really. It’s Image Photection. 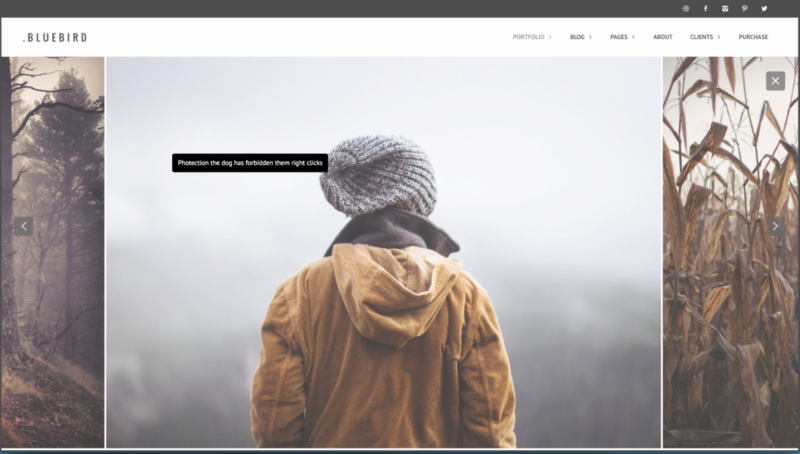 Photection is a very simple WordPress plugin that will disable right click on images. When someone tries to right-click on an image – the plugin will display a custom message where the visitor clicked. That way you can let your visitors know that either they shouldn’t copy your images, or that if they want your image – they should get in touch with you. We’re not using it in this website since all images here are Creative Commons 0. But you can see it in action in our themes, for example here in our Eugene theme or Bluebird theme. Try right-clicking on an image there to see the custom message. na stránkách plugin funguje správně, ale pokud si návštěvník fotografii otevře v plném rozlišení / otevírá se v jiném okně jako mediální soubor / tak zde je plugin nefunkční . the plugin works correctly, but if the visitor opens the photo in full resolution / opens in another window as a media file / so the plugin is not working. I went to your site and you are correct that right clicking dose not allow copying…. however I can drag and drop to my desk top just fine. Just thought you might want to know.